Lost Planet 3 will make you ask important questions, like "is this the best song to rock an ice planet?" The closest thing to a Lost Planet 3-type expedition in the real world is probably an off-shore oil rig. 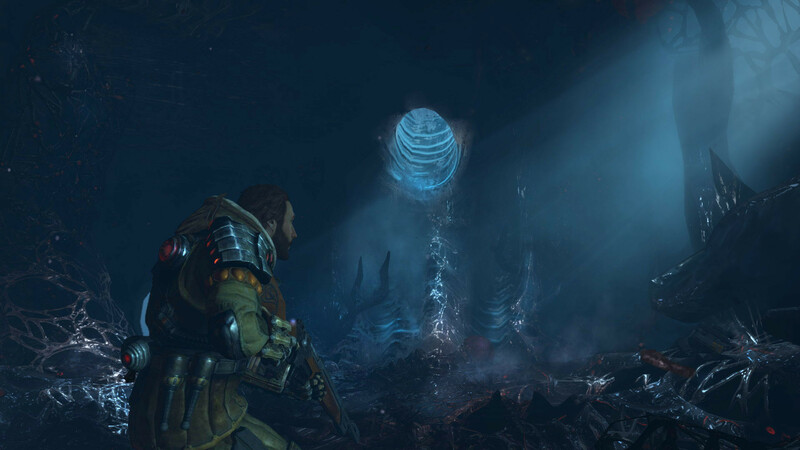 Jim Peyton, the game’s protagonist, has joined one of the first NEVEC expeditions to E.D.N III - an icy planet with a mystical energy source running through its core. With a wife and child back home to support, Jim’s looking for any work he can, and finds it on the planet’s icy surface in the form of retrieving samples of the energy for NEVEC to study. You start off as a handyman, but it’s clear this is a hostile world from the get-go and at no point is that hidden from you - you’re thrown straight into the action, with aliens in your face from the very start, and things only escalate from there. Lost Planet 3 takes an interesting approach to the third-person shooter by giving you a new perspective on life in the form of a big, shiny toy; The Rig. It’s a giant mech, which does make things interesting, but sadly whenever you’re forced to leave it - which is much of the time - the game retreats into the safe-shell of third-person shooter template action. You run around closed-off areas, shooting various different enemies, occasionally throwing grenades or ducking and dodging behind cover. It’s shoot-by-numbers, and while different species do attack/move in different ways, this variation isn’t enough to stop it being just a point-and-shoot everything you see game. Getting in your Rig does make you feel like a bit of a badass, though. It’s your transport, your weapon, your toolkit, and it’s a hunking metal machine. When you first get in it and feel it clomp towards the exit of the base, each footstep has a satisfying weight and crunch, and there’s a Top Gun-like atmosphere when you return to applause upon completion of your first real mission. This feeling is only ramped up when you get to pick custom playlists for your Rig (craftily explained by your wife from back home sending you some music to add some excitement to your repair job - as if alien species trying to kill you needed anything added), and strolling out into the ice planes with some banging tunes in your cockpit gets you feeling like a star pilot fresh out of the academy. The Rig, sadly, never lives up to its rock ‘n’ promise, for a number of reasons. Early in the game, you’re warned of giant crab monsters, and how you won’t be so smug when you come up in combat against one of them. Consider Chekov’s gun loaded, causing me conflicting emotions; I was wary of the threat, unsure when it would arise, but also looking forward to facing up against a foe worthy of my giant mech. And then a giant crab monster appeared, and my rig wasn’t around, meaning I had to go up against it with my own bare hands (and the rifle, grenades, and pistol that they held). At first, it makes you feel vulnerable - up to this point you’ve believed that you’ll need your rig when these pre-warned creatures appear, and you’re suddenly facing them without it. However, after shooting its glowing orange weak points for a while, and dodging attack after attack, you see the monster slump dead, leaving you asking a simple question: “was that it?”. This creature you were supposed to fear was defeatable without you even needing your rig, making the build-up seem for nothing. It also dilutes the experience when you do finally come up against one in your Rig, as you know it poses no threat to you. It robs you of that clash of the titans moment that you’ll be expecting; a moment that’s diluted even more thanks to the tedious combat system in place for the Rig. Essentially, no matter what you’re fighting, combat in the Rig will come down to following the button prompts on the screen, which will usually be in this order: Press Q to block/counter, press 1 to grab enemy with claw, press 2 to drill enemy with, well, drill. Rinse and repeat, and watch the same death animation again and again. It’s tedious, lacks imagination, and robs fights of any urgency or excitement. It’s most effective use is repairs and travel. As you go through the game, you unlock upgrades that allow you to navigate to hard-to-reach areas. You get a grappling hook, a zip-line that allows you to get to ledges straight from the Rig, an ability to fast-travel etc. All of this is used to reach areas where parts of stations have broken down, or you need to retrieve scientific samples or an actual scientist. 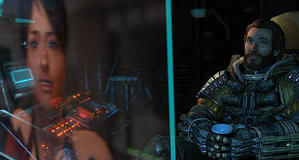 It’s a mission-based game, with optional side missions, and it never feels like it suits it - the idea of starting out as a repairman with a family back home does humanize the protagonist, but you spend too long fixing things in the same way before the story kicks in and starts ramping up. 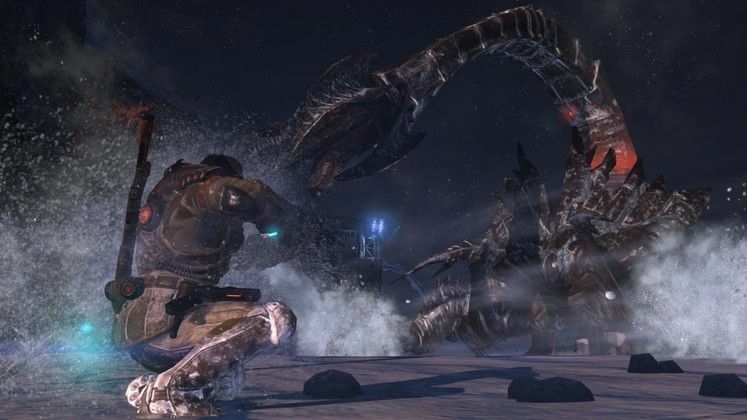 Lost Planet 3 is competent, but lacks any real soul. 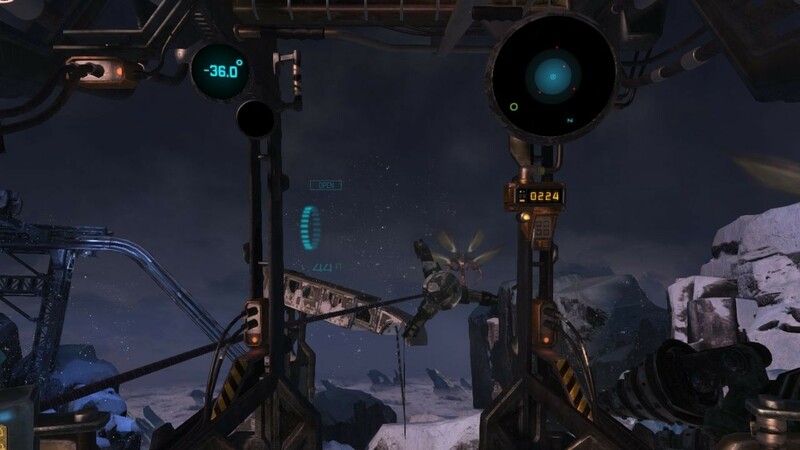 The Rig is a cool idea, and adds an interesting perspective to what is an otherwise pretty standard third-person shooter where waves of enemies come at you again and again, but even that brightest spark falls apart in execution. There’s never any real horror or drama, as you’re just pushed from point to point, making even the most potentially tense moments feel humdrum. It’ll give you some joy and a few cool moments, but nothing to video-log back to earth about. Walking through the base in your Rig to the sounds of Kill it Kid.